An enjoyable Pinot Noir food pairing is easy to achieve because Pinot Noir goes well with so many different types of cuisine. It’s one of the lightest red wines around, so it can match with lighter foods without overwhelming them. 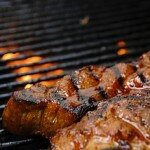 But because it is a red wine, Pinot Noir also compliments a number of meats, as long as they are not too fatty. If you are looking for a red wine pairing, Pinot Noir is a great option because of its lighter structure. Even richer seafood like lobster or crab that many people would commonly pair with white wine can be complimented by Pinot Noir. When pairing Pinot Noir with food, it’s critical that it be served correctly. Pinot Noir, more than any other popular red wine, changes its taste depending on the temperature at which it’s served. We strongly recommend visiting the Pinot Noir page in our main site to learn how best to serve it so you get the most out of your Pinot Noir and food paring. Click here to learn how best to serve it, how long to age it and plenty of other useful tips to insure your food and wine pairing is it best. Pork often goes well with Pinot Noir because its a leaner meat than beef. Just avoid the fattier cuts. Fattier meats need heavier tannins to “sweep” the fats off of your taste buds which Pinot Noir’s lighter structure doesn’t have. 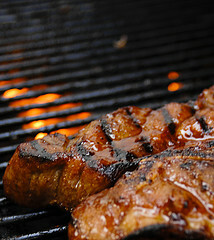 Try these simply grilled pork chops. The gamier meats like duck can overwhelm a lighter wine because of the stronger flavor and/or heavier fat content than chicken. Pairing duck with Pinot Noir is a great choice in particular because it has more fat than most other fowl (although still very light as compared to beef or lamb) and Pinot’s tannins, light though they may be, effectively compliment them. Roast duck is a perfect accompaniment. Pair salmon with Pinot Noir because of its strong, distinctive flavor and heavier oil content where white wines would often be overwhelmed. Other fish to pair with Pinot Noir are anchovies, herring, mackerel and mullet. Salmon with a mild butter sauce pairs well with Pinot Noir. Honestly, Pinot Noir is not the most natural wine pairing for these crustaceans, but if you really are not a fan of white wines but want something with your shellfish, Pinot Noir would be the best red to choose. Avoid the heavier cream sauces with Pinot Noir however because its tannins and particularly any acids it may have will react with the cream. Dishes like this simple spicy garlic shrimp recipe finished with just a touch of cream should be OK though. Dishes with a little more spice work best with Pinot Noir. 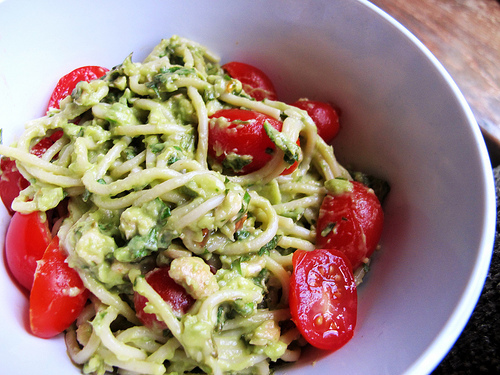 Pesto’s strong herbal flavor is complimented nicely by Pinot Noir as well as some of the refreshing white wines. Heavier tomato based sauce will overwhelm Pinot Noir’s lighter body but if it is cut with wine, broth or a touch of cream, Pinot will often work well. 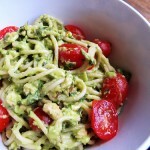 Mix your Pesto with a little tomato to give it a little more body to compliment the Pinot Noir. This recipe shows whole cherry tomatoes but I like to finely chop and sear them so the tomato flavor is blended throughout the pasta. Mushrooms sautéed with red wine is a natural pairings. The delicate flavor of the mushroom pairs perfectly with Pinot Noir’s mild red flavor. Try this recipe. 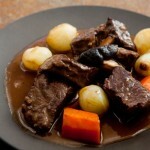 Perhaps the classic food pairing with Pinot Noir is Beef Bourguignon, which is often cooked with Pinot Noir. Although beef is not a natural food pairing partner for Pinot Noir, lightly marinated beef tenderloin or Filet Mignon will work nicely because it is a lean meat. Pinot Noir’s lighter tannin structure pairs well because there is not a lot of fat marbled through the cuts but the flavor has enough substance to stand up to the stronger beef flavor. Remember, the key to serving any wine is to serve it correctly. Too often wines are served too young, at the wrong temperature or in the wrong type of glass. 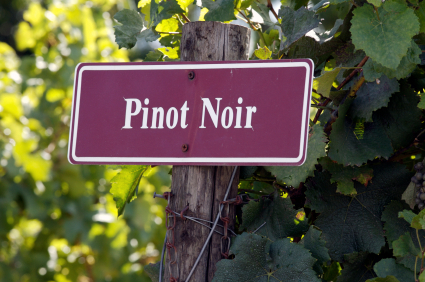 To learn more about serving Pinot Noir, check our encyclopedia entry. You’ll find lots of useful information about aging and serving Pinot Noir. 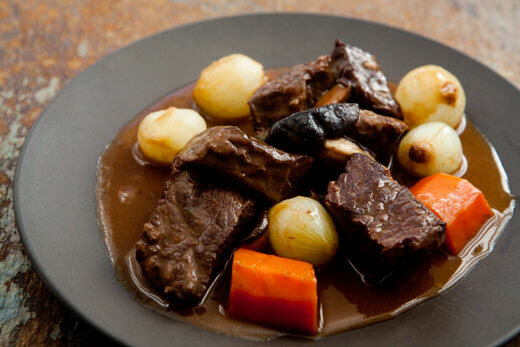 Pairing St. Patrick’s Day Food and Wine. A Match Made in … Ireland?